SINGAPORE - It seems like the "killer clown" craze has hit Singapore. 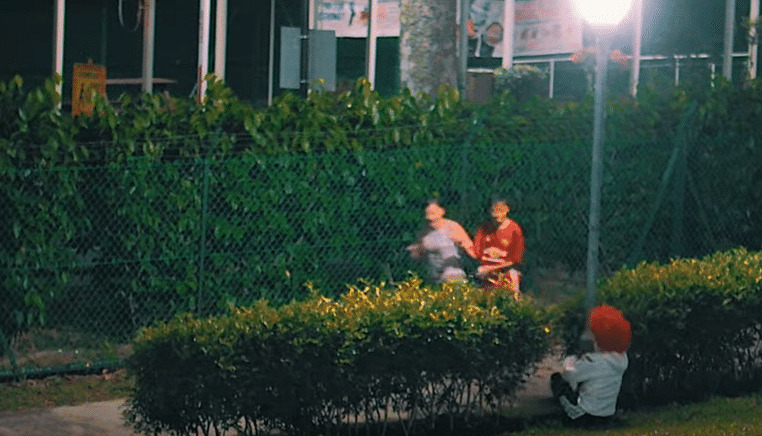 A video uploaded on YouTube on Sunday (Oct 30) by user Joel Wong shows a man dressed up as a clown scaring people in various locations in Singapore. This follows recent news from around the world of pranksters dressed in clown attire terrifying people. The video opens with the line: "Since its (sic) nearing Halloween, I decided to dress up as a clown and scare some Singaporeans." According to the video, it seems that the police carried out checks on the identity card of the prankster and "advised" him not to upload any content. But it appears that the prankster still went ahead to do so. In the video, a man is seen donning a clown mask with red hair and wearing a white jacket stained with what appears to be red paint. One of the prank sites is a park. The "clown" crouches in the bushes at night, then jumps up to scare passers-by. A mother and son pair scream at his sudden appearance. Another site is an underpass, where the "clown" tries to scare passers-by by jumping out from around the corner. Most people, however, look more bewildered than terrified. When queried by The Straits Times, the police confirmed that they received a call for assistance at Block 489C, Tampines Street 45 at 10.40pm on Saturday (Oct 29). "Upon arrival, the police engaged the parties involved and advised them accordingly," the statement said. Police investigations are ongoing, it added. The police also advise the public to refrain from such activities. The Straits Times understands that the case is being investigated for public nuisance.